Parents have inhibitions and second thoughts about leaving their newborn/toddler with the new nanny. No matter how good the Indonesian maid or Filipino maid is, moms still consider themselves the best nanny for their kids. But children have emotional milestones they need to overcome as they grow up and that includes separation anxiety. While it’s heartbreaking to hear your child cry as you walk out of the door, it’s a part of growing up and he needs to get used to being away from his mom. Eden Grace Maids Agency is here to help the Indonesian maid or Filipino maid win the child while employers are away. 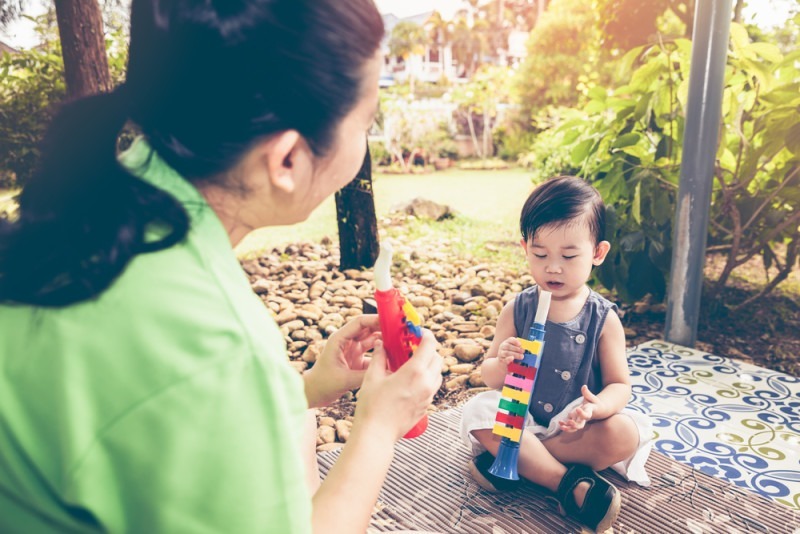 Together with your Indonesian maid or Filipino maid, check out these tips to introduce your baby to his new nanny in Singapore. 1. Choose an appropriate nanny. If the child is old enough to express himself, let him be a part of the selection process in choosing his nanny. Choose someone who is approachable, someone who fairly likes children, and has good attachment qualities. We understand that it can be difficult to measure this quality in a Skype interview but we can ask the Indonesian maid or Filipino some important questions to assess her capability to take care of your child. – What will you do when the baby is crying? – When you’re cooking and the baby in the crib suddenly cries, what will you do? – Do you know any nursery rhymes? Can you sing one? – When you’re alone with the child at home, and you found out that he’s sick, what will you do? – What’s the biggest challenge you’ve encountered in your journey as a nanny? 2. Schedule a “Nanny Practice” Day. It’s important to note that getting used to the new Indonesian maid or Filipino maid is a process that requires time. Thus, leaving your baby immediately with the caregiver for Day 1 will yield bad results. Employers can plan, putting a time allowance for the nanny and the baby to bond together for a week or two before the pregnancy leave is over. Practice days are when the baby and his Indo nanny or Filipino nanny can spend time together to get used to each other’s presence. Try not to be around the baby for half a day. Let the new nanny be in charge of putting him to sleep, feeding him, and playing with him. Also, teach the Indo maid or Filipino maid the methods you use to calm the baby down. It helps! Don’t be the first one to feel sad about leaving your baby to the Indo maid or Filipino maid. Believe it or not, child experts say babies can feel their mother’s stress as they bid goodbye. In fact, mothers should avoid sounding like they are saying goodbyes but she should say “see you later” with a matching kiss. Let it be a happy goodbye. It seems a perfect opportunity to finally walk out the door when the baby is fiddling with his toy but sneaking away is a very terrible idea! It worsens separation anxiety as the baby fears that you may disappear anytime without notice. Instead, repeat happy goodbyes every day until the baby gets used to it. 3. Put your Indonesian maid or Filipino maid in a ‘rescuer’ position. This technique may work for the Indonesian maid or Filipino maid! Author of “No Cry Solution”, Elizabeth Pantley, said we must put our Indonesian maid or Filipino maid in a ‘rescuer’ position to slowly make the baby like her. Pantley mentioned that we should let the baby be in a “neutral place” as the mother says a happy goodbye. This could mean letting the baby play alone or sit alone in his crib and once mom is out of the door, the Indonesian maid or Filipino maid can now ‘rescue’ the baby by picking him up. This strategy builds a bond of trust between the nanny and the child. 4. Sympathize with the child to win him. Naturally, he will feel sad and upset about his mom and dad leaving for work. The Indonesian nanny or Filipino nanny can take advantage of this to make him feel that she’s in his side. Just acknowledge that it’s okay to feel upset and, as a nanny, she understands how much the child misses his parents. This works best for children who can already express himself. Nannies don’t only help children become emotionally intelligent, she also makes the child feel validated and that she’s on his side. Don’t be too disappointed if the baby cries too much in the early days of mommy-nanny transitions. Instead, be patient and work closely with the Indonesian nanny or Filipino nanny to make the child like the new maid. Be a team!